What an experience for those athletes, coaches and parents who haven’t been involved in such a championship setting before. Having the entire country in one location instead of the previous east/west split was magnificent. The Direct Energy Centre in Toronto was a perfect venue, easily dealing with over 10,000 participants on 800 teams, spread out over 54 courts over a six day period. The Durham Attack 15U boys, while not exactly having a fairy tale ending to their season, unless your idea of a good fairy tale is from the brothers Grimm, had a commendable showing. And while disappointment at the eventual outcome cannot be dismissed, the boys should be as proud of their accomplishments this season as their parents and coaches are. To teammates Jared Harris, Connor Forest, John Deacon, Tyler Paxton, Riley Dyment, Alex Hatzinikou, Tristan Swinden, Jonathon Orrett, Matthew Van Camp and Bradley Whitlock; on behalf of your parents and supporters, thank you for a very entertaining and accomplished season. When you sum it up, two gold three bronze medal performances in regular tournament play, culminating in two Provincial silver medals, 15U and 16u, says a lot about the calibre of this year’s 15U team. And of course none of this would have been possible without the commitment of the coaching staff: Mike and Steve Bossence and Adam Martin. And writing of commitment, I would be remiss if I were not to acknowledge the efforts of our many parent volunteers who helped in so many ways to ensure the success of this season. So congratulations boys! Your progress and development as individuals and as a team throughout the year bodes well for your future endeavours, both on, and off, the volleyball court. Another weekend in Waterloo! But what a difference a week can make. The story of this weekend’s action? Somewhat of a reversal of last weekend’s. After a very strong 1st set against Pegasus, winning 25-9, suggesting a repeat of last week’s dominating play, the DA boys found themselves struggling in the 2nd set. Even with strong hitting and effective serving, it appeared to be quite the effort to hold on to the lead, yet the team kept their cool and managed a 25-22 victory. The Mavericks applied pressure in game 2, causing some focus issues and making our fellows work extremely hard for each point. It was a very exciting game to watch as both teams went point for point right up to the end. A couple of well timed, and placed, serves brought DA the 26-24 winning points. Some no doubt strong words from the coaching staff between sets brought back the team’s focus and their level of play in the 2nd set showed why they deserved to be at this tournament. Some skillful digging, accompanied by continued strong serving and passing kept the initial lead in Durham’s favour, and they pushed on to a 25-19 win. The 3rd game of day 1 found 15U Durham Attack up against 16U Durham Attack. The 1st set gave the appearance of two closely matched squads duking it out. It was a veritable see-saw battle, with hard hitting offenses coming up against solid defenses. Maintaining their concentration after getting up a couple of points, the 15U boys hung on for a 25-22 outcome. Set 2 had a different story line, with both teams making changes to their starting lineup. DA 16U found their chemistry before 15U, took control and dealt the junior squad a crushing 15-25 loss. Not taking that drubbing lying down, the 15u boys came back fighting in the 3rd set, challenging for every point and pushing the 16Us on every play. It was either team’s game for the taking, and unfortunately for the 15Us, it was taken 16-18 by the 16U team. Still, 2nd in their pool! Not a bad day’s work. On day 2, the boy’s get up and go; kind of got up and went. After a 1st set that did see some of their fighting spirit challenge Niagara Rapids, DA eventually lost 18-25. In the 2nd set they were visibly shaken, couldn’t find that needed edge, and went down to defeat 17-25. Game 2 was against Pakmen 16U and while the lads gave it a good try, they were outplayed and lost 14-25 & 14-25, as Pakmen used their experience to capitalize on every Durham Attack misplay. Again, not to be written off, the fellas came back in the next game, putting points together by playing with renewed focus and determination. The 1st set against the Titans was a very entertaining affair, with exciting rallies and excellent play making by both sides. A close game from start to finish, DA took the win, 25-22. Sadly, the same cannot be said for the 2nd set, as Durham once again misplaced their focus and went down to a 15-25 defeat. Bouncing back in the 3rd set, DA put on a good show of digging, blocking and more fine serving. Sorry to say it was too little, too late, and with the 13-15 loss, they fell out of Tier 1 competition. So day 3 dawned with the sobering knowledge that the team’s play would have to locate that missing ingredient if they were to contest for a Tier 2 medal. The first game of the day, against the Ballhawks, was not an inspirational display, to say the least. Although they won both sets, 25-22 & 27-25, these were not games on which legends are built. While the level of play did pick up in the semi-final vs Stingers 16U, again focus was lacking and DA just managed to stay ahead in points after taking early leads in both sets. Final scores : 25-23 & 25-22. The wins did put the boys into the gold medal game against the Guelph Grizzles. Thankfully, we of the viewing audience were given a renewed display of just how well this team can play when all cylinders are firing. They were setting, hitting, blocking and serving in a very skilled performance and it showed in the 1st set final score of 25-17. Now, when all cylinders are not firing, the outcome is quite different, as we all experienced as we watched the Grizzlies take control, and the set, 14-25. The tiebreaking set saw Durham trailing from the beginning and try as they might, and they did try, on this day they just could not overcome the obstacles they put in front of themselves. With a final score of 13-15, Guelph took the Tier 2 Gold medal, and for the second week running, Durham Attack 15U got to go home with the Silver medal. When you think about the number of teams they had to face, and the number of challenges they had to overcome, just to get to that final game, Silver cannot be considered a defeat. One more story remains….the National Campionships. Trying to transpose the 15U’s story into words is a very daunting task, but I shall try. To sum it up, you really had to be there to appreciate just how much the 15U boys elevated their game for this challenge. Early morning starts had no negative effect on the team’s performance. On the contrary, I might venture to suggest it helped them get focused faster, and that in turn helped them control their concentration level. In a pool of seven teams, the schedule was set up so three games were played on Friday and the final three on Saturday, all in the morning hours. (Intentionally using too many clichés) We start our story on day one. Durham Attack came out firing on all cylinders and right from the get go, showed they were there to play. And play they did! Not to take anything away from the other teams, but Durham’s intensity suggested negligible competition. Winning the first day by scores of 25-14 & 25-16, 25-12 & 25-9, and 25-12 & 25-19, Durham Attack played with poise and finesse. While there were some inconsistencies in the early goings, the boys came together as a team. They found their rhythm of 1-2-3, or pass, set, hit, and the points just followed. While they didn’t exactly dominate the proceedings, once they took the lead in a set, not once did they relinquish it. There were some exciting rally’s that could have gone either way, but utilizing both their strong offense and solid defense at the same time saw most of the outcomes in Durham’s favour. Day two told a different story. In game 1, vs Forest City Green, Durham Attack came up against a very impressive, and seemingly impenetrable, wall of defense. Fortunately, losing 15-25 in the 1st set didn’t dishearten the boys. In the 2nd set, they found a way around the Forest City wall and effectively built their own. After a very entertaining match, the 25-20 victory went to Durham. The tiebreaker was a tight and very close match, as the teams matched point for point throughout, until the end. There were some tense moments as it took 5 serves to win the last two points and take the set, due to wayward balls from other courts interrupting the play on our court. But maintaining a positive mind set and not letting some bad calls get to them allowed Durham Attack to win the set 15-12. The 2nd game vs the Markham Stingers was another display of skill and determination by both teams. With a combination of good passing, accurate sets and solid hits, both teams contributed to some very exciting, and lengthy rally’s, which made for a very challenging set. Stingers took the 1st set 23-25, but Durham used that defeat as a building stone and came back in the 2nd set, fairly dominating the play, to win 25-15. The 3rd set play was a continuation of the 2nd, and despite a minor setback part way through, Durham won that set 15-11. Game 3 of the day saw Durham Attack challenging Pakmen for the title of undefeated in the pool play. These teams are very closely matched and it could have gone either way. On this occasion, the breaks went in Pakmen’s favour and they took the 1st set 22-25. Set 2 saw DA take an early lead with good serves and excellent defensive moves. Then concentrated play through some extended rally’s helped maintain the point spread and Durham Attack pulled out a decisive 25-15 win. Unfortunately the 3rd set was pretty well all Pakmen and the #1 spot was won with a 9-15 final score. After a team building exercise that included lots of ice, and a decent night’s sleep, day 3 saw more dominating play by our boys as they took the 1st game with wins of 25-10 in both sets. The semi-final was a rematch with the Markham Stingers. This time around our boys were playing with more confidence and after a strong start and few mistakes in their play, the set was theirs, at 25-15. The 2nd set was a more balanced affair. After another fast start, Durham tripped up some, allowing the Stingers to struggle back within contention. But, Durham recovered their rhythm, tallied up the points and won 25-20. This guaranteed a spot in the gold medal game and surprise surprise, their challenger for gold was Pakmen. The early part of the 1st set gave every indication this would be an exciting match to watch and a challenging match to play. Unfortunately, looks have a way of deceiving, and once Pakmen took the lead they ran with it, all the way to a 15-25 win. While it was evident the Durham boys had misplaced some of their earlier poise and concentration, they continued to challenge for every point. They even had the lead midway through the 2nd set, but lost their rhythm and with it, their edge. Pakmen came back and won the set, and the Gold medal, with a final score of 21-25. Although disappointing; after all, no one ever plays for silver, the boys of Durham Attack 15U can be very proud of their accomplishment. After a season best described as a wild rollercoaster ride of highs and lows, to come into the Provincial Championships ranked 4th and go home with a Silver Medal around ones neck is nothing short of wonderful. And while it would be nice to say “great way to finish off the season”, the story doesn’t end there. The following weekend, the 15U boys entered the 16U Provincial’s. The story isn’t over. Well, the 2011-2012 OVA regular tournament schedule has come to an end. After a very up and down season, the Durham Attack 15U boys now have, over the next two weeks, two provincial championship competitions to play; the perfect opportunity to overcome their erratic play of late, rediscover their drive and desire, and regain that “play to win” mind set. After that, it will be a more confident Durham Attack 15U team that heads to the National Championships in mid-May. To say the tail end of the regular season’s tournaments didn’t go quite the way anyone had envisioned, after the very strong start of 2 gold and 2 bronze medal performances in the first four tournaments, would be putting it mildly. Looking at the overall results, one might think the squad took on too much by entering both 15U and 16U tournaments this season. However, they go into the Provincials ranked 4th in the 15U division and 8th in the 16u division. So while they may not have garnered the number of medals foreseen early on, they are still very much alive and in contention for a podium position at the Provincials. Throughout the season, the team continued to show a high level of skill at every position, but they had trouble translating those skills into regular, continuous wins. The matter of inconsistency in their play from set to set and game to game made it difficult for the boys to find the desired rhythm and flow needed for the wins required to place them in medal contention. While they did play for Bronze a couple of times later in the season, on each occasion they found themselves relegated to the sidelines during the medal presentations. Hope springs eternal and if the team can regain the required determination and desire to win, there is no reason they cannot come away this year with Provincial medals hanging around their necks. Find your personal motivation guys. Talk it up and motivate each other…….. and GO GET ‘EM!. This tournament was a display of drive, determination, and desire, on the part of each and every member of the 15U boy’s squad. The day’s challenges were apparent just from looking at the pool play competitors. Starting the day against the 15U Pakmen ment the boys couldn’t start slowly, and they didn’t disappoint. Taking the 1st set from Pakmen certainly announced an intention of playing for every point. While they fell short of maintaining this high level of play in the second and third sets, the inspired spirit remained. The second game was against Storm Fury and once again the DA boys challenged them in three excellent sets, before taking the eventual loss. The 3rd game of the day brought DA up against the 16U Ottawa Fusion. There was an obvious letdown of focus in the 1st set and the Fusion, taking full advantage, took the set 25-15. The 2nd set saw a renewed concentration and complete team effort and not only could the audience see it, the boys could be observed feeling it. There was a return to the determination and focus the fellas showed in the 1st set against Pakmen and while DA didn’t win on the scoreboard: final score 26-28, they did win in the conquering of some of their previous short comings. Carrying this renewed focus into the next game, against Scarborough’s STVC Swag, Durham Attack had a team concentration that was palpable. The players were talking to each other and when pressure was applied by the Swag, our boys responded in kind. It was a very tight set and DA kept bringing it right to the last point. Attack triumphs 25-20. Both teams started strong in set 2, with very solid serving being the anchor of many engaging rallies. While there were some fumbled plays which allowed STVC to catch up, DA kept digging and serving well to maintain a small but continuous lead. Even a couple of STVC timeouts couldn’t break the focus of the DA attack. Again I will mention the recently acquired communications skills of our players, which went a long way in enabling them to control the rhythm of the game and take the set 25-19. While the day’s losses put our 15U DA boys out of medal contention, they had one more challenge to face going into their final game: a loss would drop the team out of the Premier division. Adding to that pressure; they found themselves competing against the Durham Attack 16U boys for that one remaining tier 1 position. It was also tough for the audience as it just felt wrong cheering for/against Durham Attack. Never the less, it was a good, challenging, high spirited competition. The fairly evenly matched teams each had some killer spikes ending exciting rally after exciting rally. It was really only some misplays and some mental lapses that made the difference between the two squads. The 16U boys maintained an early edge and took the 1st set 17-25. Set 2 saw some lineup changes on both sides and while it didn’t help the 16U boys, the 15U team displayed an invigorating intensity of focus and drive with hard hits off accurate sets, mixed with timely soft touches. There was steady play by everyone with a major second effort whenever it was needed. All this accompanied by continued solid serving resulted in a 15U 25-18 win. Right off the 1st serve of the tiebreaker, it was evident the 15U boys had maintained the sense of urgency and the momentum they started building in the previous set. It was a very tight game with point for point play from both teams. Watching, one felt it could go either way. But, along with the 1 point lead at the midgame switch, the 15U squad appeared to have the mental edge. While the score stayed close, you could feel the tide turning in 15U’s favour. With consistent blocking, stellar digging, hitting and setting of strategically executed tipovers, DA 15U played their game and took the win 15-13. More learned lessons to take with them to the March 3rd 15U tournament, and beyond. 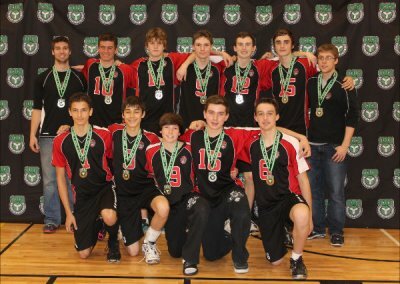 You get what you play for, and at the end of the day the Durham Attack 15U boys played for Bronze. The boys began the day with their usual slow start, giving a plodding feel to the proceedings as they matched The E381 Eagles point for point until it was tied 18-18. Then, the Gatorade kicked in, the cobwebs of the mind cleared and the plays started coming together. With some good serving, accurate sets and some killer spikes, DA finished the set with a 25-19 win. Even with a lineup change in the 2nd set, the upward momentum continued, with strong net play, good focus and an organized defense. The boys quickly took control, and a commanding lead. Some misplays by DA allowed the momentum to briefly swing in the Eagles favour, but our boys came back and finished it off 25-16.
to take the lead before the Purple called a time out at 15-10. Putting more focus into their sets and rallies, DA managed to maintain the lead, even while struggling with their service game. Unfortunately, at 21-20 DA’s drive stalled, and they dropped the set 22-25.
focus during some extended rallies saw DA take the set 25-19.
to pick it up and fight their way to a 19-17 final. with some well placed shots. As the Storm’s defense faltered, the Attack intensified their attack, battling both the Storm’s offense and some questionable officiating to secure the 25-21 victory. proving strong offensively, DA kept digging. Determination kept the boys in the match and they slowly closed the points gap. would carry the boys through, but Storm hung on for the 24-26 win. Matt and Connor countered some bad calls and poor play, giving the boys time to regain their composure and pull off a close 15-13 win. while being challenged by a very strong opposition and more questionable calls. The boys fought to maintain their minimal lead, stayed in control of themselves and enjoyed a 25-21 win. and just didn’t have enough for the desired comeback. While DA made a good show if it, Pakmen took the set 16-25.
by a score of 8-15.
confidence building start in the 1st set of this competition, with Brad serving extremely well and the Warriors not returning much. It was almost anti-climatic as Durham made quick work of Woodstock. Durham Attack took the set 25-13. The 2nd set was a repeat of the 1st, with hardly any competition from Woodstock. The final score of 25-17 really isn’t indicative of the caliber of play. If not for some misplays on the part of our squad,the point difference would have been even greater. Along with the Bronze medal, lessons a plenty were taken away from this day’s action, which will go a long way in helping the coaches build on the teams strengths in preparation for the next tournament.